Note: Bulletin deadline is the 2nd Friday of the month. Can you believe the year is half over already! The weeks have been zooming by! Well, I have started my second term as President, and I’d like to congratulate my new officers and thank my old ones for the fine job they did last year. Here’s hoping this year is as good as the last. Our membership is staying strong and, judging by last nights Red Wing final, there are more and more people enjoying the social room than ever. I am heading to my very first State Convention next week, and I’m not quite sure what to expect, other than a massive hangover. But I will be sure to share with you any new developments. We are celebrating our 83rd anniversary on June 28th and initiating quite a few new members. I will also announce my choices for Eagle and Father of the year. I will tell you about it in my next letter. In the meantime, have a safe and happy 4th of July! Hope to see you around the club. You can reach me by e-mail at: dejbob@yahoo.com. You will get this newsletter before our annual picnic and hope you attend. It is a fun day and lots of prizes raffled along with 50/50's. If you would like to volunteer to help anytime that day we would really appreciate it. Remember our meetings are the second and fourth Tuesday of the month at 7:30 pm. We need your input and support. Have a great summer. $30.00 for regular membership, $8.00 for Golden Age Eagle membership and Dual Membership is $15.00 with proof that you have paid in your home Aerie. Remember I can be contacted at the club 248-280-0244, my cell 248-821-6081 or by e-mail salb919@yahoo.com. GOLDEN AGE EAGLES dues are $10.00/year. I have just been informed by the Grand Aerie that ALL new or re-enrolled members after June 1, 2009 will be considered Non-Benefit members. The difference between a Non-Benefit and Benefit member is that there will be NO death benefit paid. If you have any questions, please do not hesitate to contact me at (248) 541-5694. Aerie & Auxiliary members we have started an Eagle Riders Club. Eagle members from Royal Oak, Clawson, Madison Hts. and Hazel Park met on December 3rd and we officially started. Meetings will be held on the first Wednesday on each month at 7:00 PM, at Royal Oak. Do you have to own a motorcycle? the answer is NO. Any Aerie or Auxiliary Member from any club can belong. You can get information from Pat Heath at 248-495-5727 or Sal Bellestri 248-546-6430 or my cell 248-821-6081. $20.00 is the charge to join, this included the official Eagle Riders patch that cost $15.00. We are still collecting soup labels and box tops from General Mills products. There’s been a change tho and they want mainly the UPC code from the cans, but asking for the whole label. I donate these to Webster School in Hazel Park, my son goes to this school that is why I choose this one. Just leave them at the bar with my name on them. 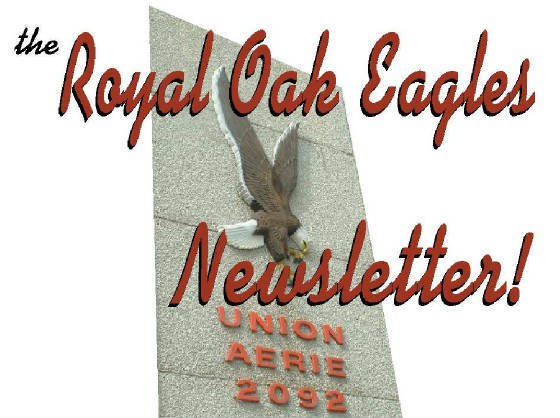 Published Monthly by Royal Oak Union Aerie No. 2092, 401 East Fourth Street, Royal Oak, Michigan 48067. Other than official notices, no responsibility is assumed for statements made in articles. All contributions must be signed to be considered for publication in the NEWSLETTER. The name of the sender may be withheld upon request.